I have been making this natural healing remedy for pain ever since my partner, Ken Holmes, had surgery recently. 1. Ginger contains powerful natural anti-inflammatory compounds called gingerols that suppress pro-inflammatory compounds cytokines and chemokines. Several scientific studies have proven that ginger relieves pain. In addition, a common side effect of many conventional prescription pain medications is nausea and vomiting. Ginger calms the digestive system and alleviates nausea. As little as 1/4 inch may provide relief. 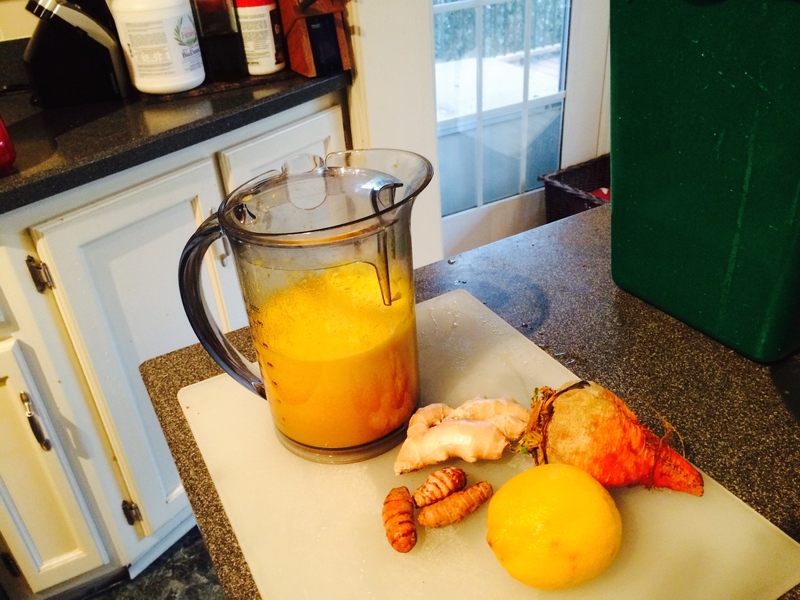 However, I usually throw in at least 3 inches of ginger when I am juicing for two people. 2. Turmeric is the yellow spice that gives Indian food its distinctive color. The volatile oil in turmeric is anti-inflammatory. The yellow pigment curcumin has been proven to be equally effective to conventional pain medications hydrocortisone and phenylbutazone as well as over the counter medications – but without the side effects. 3. Lemons are high in vitamin C and also have antibiotic effects. When you have go to the hospital, it is important to build up your immune system both before and afterwards, as a mere 30 minutes in a hospital can suppress your immunity. Lemons have also been proven an effective anti-inflammatory remedy. 4. Although red beets are also beneficial, I like to use golden beets in this recipe. You can sneak in more healthy vegetables without anybody in your family noticing! Beets are anti-inflammatory because of their betanin, isobetanin, and vulgaxanthin (say that real fast and I will give you a nickel!). In addition, beets are a good source of betain, which regulates the inflammatory markers C-reactive protein, interleukin-6 and tumor necrosis factor alpha. 5. OK, by now, you are wishing you were over at my house loading up on healthy nutrients. I always like to include ingredients that taste good as well as being good for you! Oranges fit the bill for this juice. Of course, they are high in vitamin C to help you rebuild your immune system after surgery or injury. The carotenoids, zeaxanthin and beta-cryptoxanthin in oranges are also anti-inflammatory. Why would you want to juice for pain relief? By juicing regularly, you may be able to reduce or eliminate your reliance on prescription or over-the-counter pain relievers. Meanwhile, you will find yourself suffering less, having better energy, thinking more clearly and renewing your enthusiasm for healthy exercise. What is healing? Healing happens when we choose solutions that are win-win-win, that rebuild our total well-being while relieving our pain and suffering. Great dog! I make some similar frertits’ with leeks or any other green veg chopped & sauteed. A tablespoon of coconut flour (I’ve used Gram flour too) helps keep them together and with some spice are similar to onion bhajis but better!